The key to the success of this recipe is the quality of ginger. Use very fresh, young pink Caribbean ginger that is sometimes available in supermarkets, or else buy it from African and Caribbean grocers or markets. Makes 6 to 7 x 70cl bottles. 1. Bring the water to the boil. 2. Meanwhile finely crush the ginger in a mortar or a food processor and place it in a bowl. Add the sugar, and lime juice and zest, and mix well. 3. Pour the boiling water over, and add the grains of rice. 4. Place the mixture into a stoneware jar, and allow to stand in a cool place for a week. Give the liquid a vigorous stir or shake once every day. 5. After a week, strain and bottle the ginger beer. 6. Refrigerate for 1 or 2 weeks. 7. 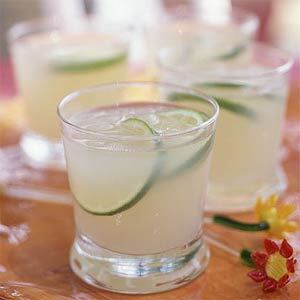 Serve in tall glasses with lots of ice, slices or lime and, if you like, a splash of rum.